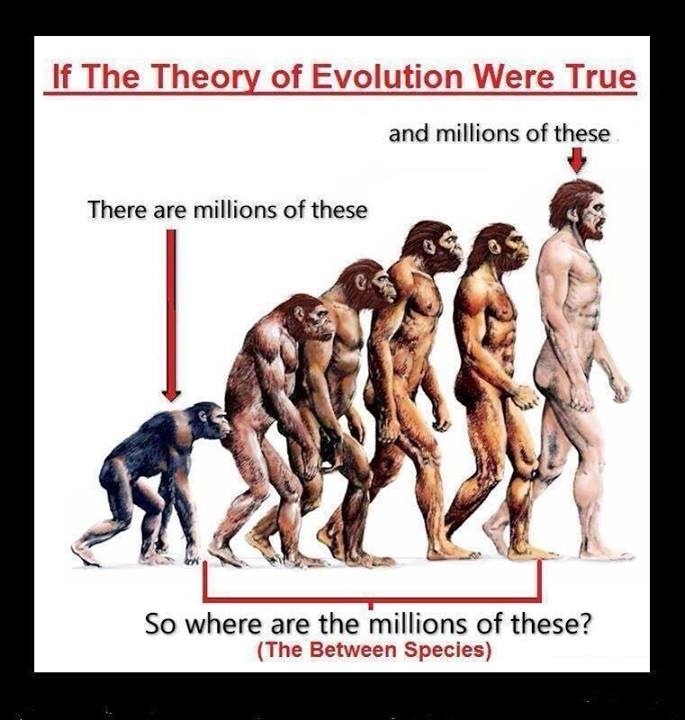 The image used for this execrable meme is a variation of the March of Progress image, which first appeared in the Time-Life Books’ series Life Nature Library in the 1965 volume Early Man. The image is meant to depict 25 million years of humanity’s evolutionary history, starting with ape-like ancestors and proceeding to more recognizably human forms. Much criticism has been lobbed at the March of Progress image because it portrays human evolution as a linear chain of ancestors and descendants instead of as a “copiously branched bush”, to quote evolutionary biologist Stephen Jay Gould. To be fair, the authors understood that this straight-line progression was inaccurate – they noted as much in the details. Apparently the devil’s not into details, though; the descendants of the original image come disclaimer-free, which leads to the erroneous impression that this is truly what anthropologists think human evolution looked like. This misleading, over-simplified image is perfect fodder for Creationists who don’t wish to be bothered with all the subtle intricacies of evolution. We’ll talk more about the discrepancies between the Creationist model of evolution and the scientific model of evolution in just a moment, but first I have a quibble about the author’s two uses of the word millions. In neither case is it appropriate. I assume the author believes the first animal in this line-up is a modern chimpanzee. (It’s not.) The Jane Goodall Institute of Canada estimates that there are fewer than 150,000 chimpanzees left in the wild. There may be a few thousand living in zoos or in laboratories around the world, but there is absolutely no way to justify the claim that Earth still contains millions of chimpanzees. Nor that it contains millions of humans. As of now, there are about 7.46 billion humans on Earth, according to the World Population Clock. Billion, not million. I suppose you could argue that a billion is bigger than a million, and that it is therefore permissible to describe the human population in terms of many millions. But I object to such careless usage, and particularly in this case, because it implies that the chimp population and the human population are within an order of magnitude of each other. They are not. Of course, any discussion of chimpanzee population is rendered irrelevant by the fact that the animal on the left is not a freaking chimpanzee! This is a point that Creationists cannot ever seem to fathom: at no point in a reputable biology textbook does it say that humans evolved from chimpanzees. We would not expect to see any transitional species between humans and chimps, because chimps did not transition into humans, nor will they. Let’s be clear: whatever creature the image on the left represents is dead, and has been for millions of years. It is not a modern chimpanzee. So where do modern chimps fit into our evolutionary lineage? They don’t. Modern chimps are nowhere in humanity’s evolutionary history, in the same way that your cousin is not part of your ancestry. There was a species millions of years ago that appears in the evolutionary history of both humans and chimps, but…and I really must emphasize this…that species is long gone. It was a branching point between two diverse future groups, but it no longer exists. The “Between” species mentioned in this meme are not half-human, half-chimp abominations that ought to still be running around. They are…were…nodes in the evolutionary tree leading up to the tip of the branch that represents Homo sapiens. Each node may have given rise to myriad daughter species – unfortunately most of them met extinction, which is the eventual fate of every evolutionary lineage. Our sister and cousin species are no longer on this planet except in the form of fossils. If you wish to hold an extended family reunion, you must do so in a museum. Evolution is true, a fact that is not in doubt to anybody who has invested the time to study it without a preconceived desire to see it dismantled. The Theory of Evolution is not scientists’ way of expressing doubts about the validity of biological evolution (just as the existence of a Theory of Gravity does not indicate that scientists are uncertain about whether gravity is real). It is a robust, well-supported model that attempts to explain how evolution occurs. The saddest part of all this is that the author of this meme probably thinks himself terribly clever, while his gross misunderstanding of evolution reveals that he is anything but. I realize I’m probably giving it far more attention than it deserves, but I have decided to dedicate an entire Stupid Bad™ week to the mother of all conspiracy theories: Flat Earthism. Strap in, kids! I know what you’re thinking, and you’re right: This is low-hanging fruit. Still, it bears discussing, because the Flat Earth belief system (I refuse to call it a theory) has recently enjoyed a sudden resurgence of attention thanks to the Twitter ramblings of Atlanta-based rapper B.o.B. and former celebrity (or so I’ve been told) Tila Tequila (Warning: NSFW language). Now you might think it unworthy of your time to pay much attention to the ill-informed tirades of a couple of limelight seekers, but here’s the thing: Flat Earthism is not just embraced by those desperately clinging to relevance. You’ve heard of the Flat Earth Society, often invoked as a proxy for someone who holds really, really ludicrous beliefs? Well, they’re real, and by all accounts, they’re serious. Before we go any further, let’s say something that ought not need to be said: Earth is not flat. Earth is a sphere, or an oblate spheroid if you’re pedantic. There are so many lines of evidence converging on this singular conclusion that to deny the roundness of Earth smacks of outright contrarianism and willful ignorance. There are several different forms of Flat Earthism, and it’s beyond my means or desire to compare them all. Suffice it to say that the defining characteristic of all Flat Earth belief systems is that our planet is not a planet at all, but a more-or-less flat disk, with minor variations in flatness where we experience hills, valleys, and suchlike. Dedicated Flat Earthers have answers (not good answers, but answers nonetheless) for every objection that might be raised by a Globe Earther – by which I mean somebody reasonable and correct. The most prevalent version of Flat Earthism holds that Earth is a circular disc, with the North Pole in the center and Antarctica around the rim. Acoording to this model, Antarctica is an ice wall that holds all of Earth’s water in place. But wait, you might reasonably ask: Wouldn’t gravity cause an object as big as Flat Earth to automatically crush into a sphere? Gravity doesn’t exist, they say, or at least, it doesn’t exist on Earth (although gravitation apparently does exist among the Moon, planets, and stars, which raises even more questions). What we perceive as gravity is actually the result of Earth accelerating through space at about 9.8 m/s². That in itself is not as crazy as it sounds: Einstein showed that an accelerating reference frame is totally indistinguishable from a stationary reference frame in which there is a constant gravitational pull. Flat Earthers, however, have yet to explain what force could possibly cause an object as large as Earth to accelerate perpetually. Even in a Flat Earth model, mass and inertia are still real things that must be overcome in order to make something accelerate. Furthermore, why does gravity vary with altitude, if Earth is simply a disc accelerating through space? Apparently the weak gravitation of the Moon, Sun, and stars partially negates the effect of the acceleration-induced pseudo-gravity we experience while standing on Earth’s surface. Yeah, I don’t know how that’s supposed to work either. But it makes perfect sense to a Flat Earther. So what kind of person is the typical Flat Earther? Based on this meme, you might think that modern Flat Earthers are also Biblical literalists. That’s rarely the case, though: in fact, Daniel Shenton, President of the most recent incarnation of the Flat Earth Society, accepts the reality of evolution and human-caused climate change – ideas that are typically anathema to religious fundies. One Flat Earther even claims that evolution proves that Earth is flat, if you can imagine such a thing. Creationist groups jubilantly point this out to their detractors: “See? Flat Earthers believe in evolution and global warming as well! If Flat Earthers are so wrong about the shape of Earth, then maybe they’re wrong about the other stuff too!” Creationists are also quick to claim that Flat Earthism was not prevalent during the Church’s glory days in the Middle Ages, and that only a small but vocal minority of Church officials rejected the idea of a globe Earth. In any case, this meme’s author apparently did not get the message about Creationists eschewing Flat Earthism. In his literal interpretation of scripture, Earth is unmoving, which means he must reject other Flat Earthers’ ideas vis-à-vis constant acceleration. This guy is marching to the beat of his own ignorant drum, and I say good for him. Don’t let anybody else tell you how to be nuts, anonymous meme maker! Since this guy’s diatribe is likely to ignite a firestorm of controversy among the Bible Believers, let’s tackle this question next: What is the Bible’s official position regarding the shape of Earth and its motion through the cosmos? According to Bible-believing Globe Earthers: the Hebrew translation of the word circle can also mean sphere (although that might be wrong, according to the Institute for Biblical & Scientific Studies), which means that, at best, there’s a 50/50 chance that this passage speaks of a spherical Earth. And hey, a 50/50 chance is all a Biblical apologist needs to press on! Job 26:7 (KJV): He stretcheth out the north over the empty place, and hangeth the earth upon nothing. See? It says so right there! Earth is just floating in space, not resting on the backs of turtles or what have you. The “him” referred to in this passage is Jesus Christ. Are we to assume that Matthew is using the “language of appearance” when he claims that there is a mountain tall enough to see all the kingdoms of Earth? If Earth is a globe (and it is), then there is no way you can view all of its kingdoms, even from the tallest mountain. The highest point on Earth is the top of Mount Everest, which, at 8,848 meters above sea level, gives you a view of about 340 kilometers (211 miles) in any direction that isn’t obscured by another mountain. The largest authoritative jurisdictions in the time of Jesus were the Roman Empire ringing the Mediterranean Sea, the Parthian Empire centered on modern-day Iran, and the Han Dynasty in China. These three empires, along with other autonomous regions, formed a continuous chain of dominance from the Atlantic Ocean to the Pacific Ocean, nearly 12,000 kilometers (7400 miles) long. If Mount Everest were dropped smack in the middle of the Roman Empire during the first century C.E., not only would you not be able to see all the kingdoms of the world, but you wouldn’t even be able to see all of the Empire. Unless you believe Earth is flat. So…either Matthew was speaking metaphorically or making a gross exaggeration, or he truly believed that Earth was flat and that all of its kingdoms were visible from a sufficiently tall mountain. All of these possibilities are embarrassing for Biblical literalists and Creationists trying to distance themselves from Flat Earthism. And so is this meme. The bottom line is this: it doesn’t matter whether a Flat Earther is a Creationist or one who accepts the well-supported theory of evolution by natural selection; in either case he is wrong about Earth’s shape. No matter what his motivations or arguments are, he is wrong, and demonstrably so. People have known for thousands of years that Earth is round; it’s one of the oldest established truths in all of modern science. To claim otherwise in 2016 is to be willfully ignorant and proud of it. In observation of Poe’s law, which says that parodies of extremist views are easily mistakable for sincere expression of said views, I realize that this meme might be a parody. In fact, I sort of hope that is the case, for the author’s sake. Parody or not, however, it is still representative of very wrong ideas that some people seem to genuinely believe. Once again I would like to extend my profound thanks to Friend of the Blog @IbrahimKaher for pointing me toward this particularly idiotic meme. There are limited resources, so there will always be competition, between and within species. There are variations within a species that can be passed from parent to child. If one of these variations enables an organism to gather resources more effectively than her competitors, then she will be better nourished, and consequently live longer and produce more offspring. Over many generations, favorable traits will multiply within a population while unfavorable traits will diminish, if not disappear entirely. Darwin went on to explain how the long-term aggregation of small changes could lead to large-scale changes, and eventually to the immense biodiversity evident in Earth’s panoply of life. There is nothing particularly atheistic about Darwinism. Darwin’s theory neither supports nor refutes the existence of God, which is the only question that atheism addresses. The only way you can convince yourself that Darwinism is atheistic is if you staunchly refuse to budge from your position of literal Biblical creationism. If you believe that Earth and all of its modern life was spoken into existence by a divine creator, and if you believe that any statement to the contrary is against God, then there is no end to the branches of science which you will interpret as atheistic. In that case, you should remove yourself from the scientific conversation altogether, because you are in no position to offer helpful contributions. Perhaps the meme’s author is confusing Darwinism with social Darwinism. Social Darwinism is the application of the phrase “survival of the fittest” to all aspects of human culture, including economics, politics, and ethics. There is no overarching definition of fitness with which all social Darwinists agree, but in general, the strong (or fit) thrive while the weak (or unfit) languish. Social Darwinism has been associated with (and blamed for) ideas from laissez-faire capitalism to eugenics, racism, and Nazism. The main idea here is that atheists are not inherently social Darwinists, nor are Christians inherently selfless altruists. Both atheists and believers count good and bad people among their ranks. If an atheist performs a selfless act, it’s because he wants to do so (and most likely, because his social upbringing conditioned him to do so); not because he fears an eternal punishment for not doing so. In my opinion, the same is true for believers. Yes, the faithful justify their good deeds (if such things require justification) as manifestations of God’s grace, but strip away the layers of ingrained belief, and you find that they are simply good people who are emotionally rewarded for doing good things. Now let’s address the meme’s claim that selflessness is inconsistent with Darwinism. If you wish to apply Darwinist principles to explain altruistic behavior, you can easily do so. Humans are social animals. We live in groups because it benefits us to do so. For social animals, tribal cohesiveness is key to our survival. Altruism stems from a time when a person’s social group consisted of closely related individuals. If you perform a selfless act, perhaps even one in which you risk personal harm, in defense of a tribal mate, then you have ultimately strengthened your bloodline. You have perpetuated your kind, and in doing so have served the single greatest purpose that evolution demands. If you’re a Christian, you can’t claim ownership of morality any more than an atheist, Muslim, Jew, or Hindu can. Your morality – my morality – all of our moralities – stems from the fact that we are human. We do good by helping others because it strengthens us as a species to do so. Whether you believe you are serving God or Darwinian principles, selfless devotion to our species is your birthright. Except that’s not true either. Humans are not monkeys. Humans are apes. Apes are not monkeys. Look, it gets complicated. strepsirrhines, which include lemurs, lorises, bush babies, and pottos. The streppies (an unofficial name which I have just now coined for them) are characterized by their wet noses and by their ridiculously adorable large eyes. haplorhines, which include tarsiers and simians. Happies have dry noses (except during pollen season, am I right?) and the all-important ability to make comical facial expressions. I’m totally serious about that: haplorhines have a lip adaptation that enables them to contort their faces into all sorts of goofy shapes that are, sadly, beyond the reach of strepsirrhines. The flat-nosed, or New World monkeys (from Central and South America), which include: marmosets; tamarins; capuchins and squirrel monkeys; night or owl monkeys; titis (snicker); sakis and uakaris; and howler, spider and woolly monkeys. As the name implies, New World monkeys are all part of the nefarious New World Order, which, with the help of the Illuminati, are poised to take over control of the entire world. The down-nosed simians, which include Old World Monkeys (from Africa and Asia) and the apes. Now let’s pause for a moment and reflect on what we’ve learned. Humans, apes, and monkeys all share a relatively recent (by geological standards) common ancestor, and we’re all part of the same order. But let’s wave goodbye to the monkeys, for it is at this point that humans and our ape brethren take an evolutionary detour. Once we start down the path of apeness, ne’er another monkey shall we see. So what is it that distinguishes apes from monkeys, structurally speaking? As this page explains, apes tend to be larger than monkeys (although there is a slight overlap in general body sizes). Apes also lack tails, have a broader chest than monkeys, and are often able to walk upright (and in the case of humans, do so almost exclusively). The apes belong to a superfamily called Homonoidea, and (surprise!) this group may be further divided into smaller groups. The lesser apes – a hurtful epithet if I’ve ever heard one – include the gibbons of India, China, and Indonesia. The great apes: chimpanzees, orangutans, gorillas, bonobos, and yes – humans. Great apes are generally larger than all other primates, have a more upright posture, exhibit some degree of sexual dimorphism (meaning males and females differ markedly in appearance), and have nimble fingers that can be used to make and wield tools. Because you know what? 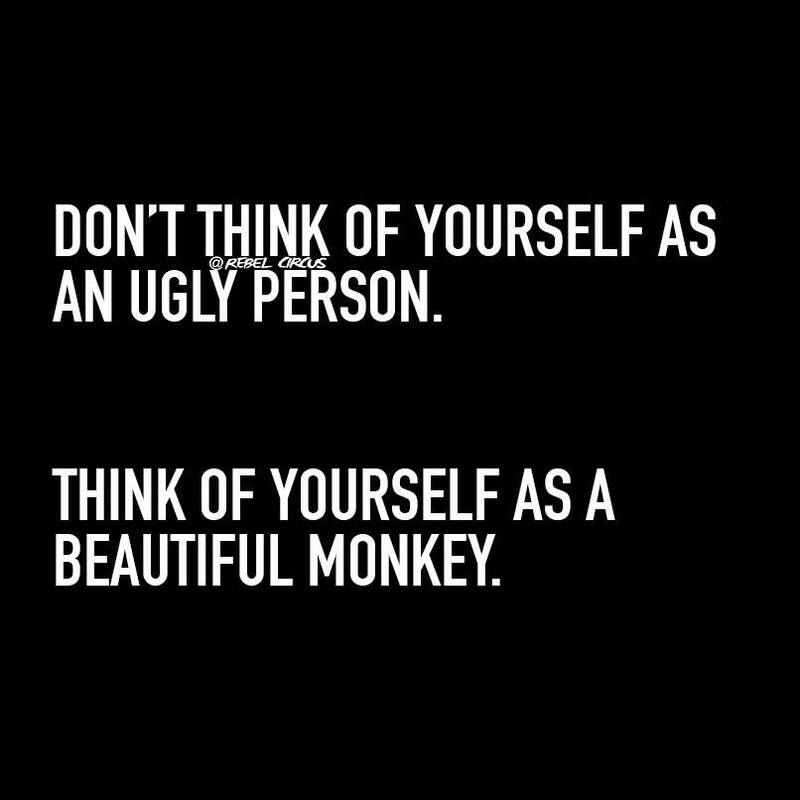 You are a beautiful ape. You really are. I’ve seen this video passed around often enough, so I guess it counts as a meme. Josh Feuerstein wants to destroy evolution in three minutes. He actually talks for 4 minutes and 48 seconds, but give him a break: it’s hard to disprove 150 years’ worth of evidence in just three minutes. Predictably, Feuerstein makes every Beginner Creationist mistake (he hasn’t graduated to Advanced Creationist mistakes, I guess). My original plan was to write a whole lot of words explaining why Feuerstein is entirely wrong, but then I remembered: I’ve already done that, and so have a lot of other people. So instead, I’ve formulated the rules to a drinking game that one might play while watching Creationist videos like this one. For legal reasons, if you actually attempt to play this game while watching Feuerstein’s video, Stupid Bad Memes cannot be held responsible for damage or injury caused by excessive intoxication and/or alcohol poisoning. Drink responsibly. Infers that evolution acceptance and atheism are one and the same. Conflates biological evolution with the Big Bang. Conflates biological evolution with abiogenesis. Claims that evolution is not scientific. Uses some variation of the phrase “just a theory”. Characterizes evolution as “mysterious” or “magical”. Implies that the modern theory of evolution is entirely the work of Charles Darwin. Claims that evolution has never been observed. Claims that evolution requires just as much faith as Creationism (or even more). Makes some variation of the following claim: Observed cases of evolution don’t count because we don’t see bacteria evolving into penguins. Invokes the Second Law of Thermodynamics as an argument against evolution, even though it’s obvious he doesn’t understand it because he thinks it prevents “order” evolving “from chaos”, or some such nonsense. Creates a laughably inaccurate analogy for evolution (or the Big Bang); a tornado creating a sports car from a junk pile, e.g. If you’re not too sloshed by the end of the video, you can finish your drink when Feuerstein rolls out his armchair etymology for the word universe. According to Feuerstein, the word derives from uni-, meaning one, and verse, meaning a spoken statement. Hallelujah, even the word universe declares God’s handiwork! Well, not so much. Feuerstein is half right; uni- does mean one. But the verse part of universe has nothing to do with a spoken statement. The second part of the word ultimately descends – dare I say evolves – from a Latin verb meaning to turn. So the word universe etymologically means turned into one. Now I suppose you could attach some religious significance to that if you wanted to, but be sure you’re attaching significance to the right words. It’d be pretty embarrassing if some snarky blogger with a search engine could prove you wrong in, say, three minutes. I admit, the idea for a Creationism drinking game was not novel; I just set the rules to reflect the grievous astronomical, biological, and physical errors Josh Feuerstein makes in his rant. RationalWiki has a drinking game to use if you ever run across one of those Advanced Creationists…you know, the ones who don’t actually use the Second Law argument anymore. Somebody called Doktor Zoom posted a drinking game on Wonkette that was custom-tailored for the Bill Nye / Ken Ham “debate”. It’s much meaner than my drinking game. For example: if a Creationist says that evolution is “only a theory”, you’re to trip them and say that gravity is “only a theory”. Yeah, that’s pretty mean. Don’t do that. One more: the Skeptic Friends Network has a thread in which the users have offered helpful suggestions about what kinds of Creationist tactics might drive you to drink. I have run out of week before I ran out of Stupid Bad Creationist Memes, so I’ll shoehorn the last few memes into one post, if nobody minds. If you do mind, tough. Start your own snarky meme dissection blog. Ahem, anyway. 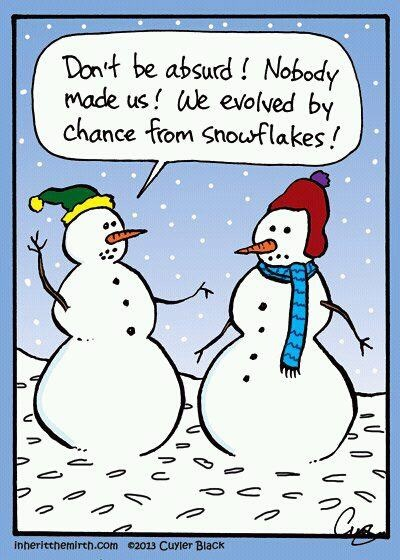 I wouldn’t expect a snowman to be particularly well-versed in evolution, and this meme does nothing to change my expectations. The speaking snowman (!) is making two critical mistakes. First: snowmen – even talking snowmen – are not people. A snowman being built up from individual flakes is not the same as humans evolving from single-celled organisms in the distant past. Therefore, you cannot use the absurdity of snowflake evolution to discredit biological evolution. Second: mutations occur by chance, but evolution does not. Evolution selects for beneficial mutations (where beneficial means bestowing a survival or reproductive advantage). It’s not that hard to get it right, unless you’re getting it wrong on purpose. Settle down, Batman! North Vietnam’s condition has nothing to do with its rejection of Creationism. I’m no expert on Vietnamese history, but I’ll bet there have been far more important events that molded North Vietnam. 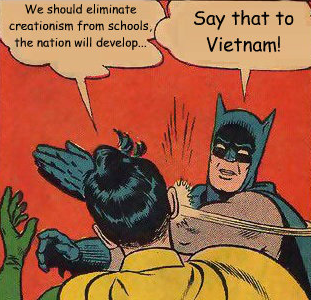 Why would Batman make a connection between Vietnam and Creationism anyway? Perhaps because North Vietnam is an atheist state. Batman thinks that barring Creationism from public school science classes will make America an atheist state as well. Actually, accepting evolution does not go hand in hand with atheism. There are lots of theists who accept evolution (the Pope does), and I assume there are atheists who don’t believe in evolution. Granted, most atheists do accept evolution as a fact because they have no religious reason to reject it, but I won’t speak for all of them. The United States is not an atheist nation, and preventing Creationism from being taught in public schools will not make us one. The United States is a secular nation, which means that we don’t favor one particular religion over another (at least in theory). And that has nothing to do with science class. We don’t teach Creationism in science class because Creationism isn’t scientific. If you combine science with religion, students will be confused about what is science and what isn’t. Although this meme pits theist against atheist, it may as well be Creationist Vs Evolutionist, since Dawkins’s support for evolution is nearly as well-known as his atheism. I’m not sure what Isaque Newton is known for. I wonder if he’s any kin to Isaac Newton. They kind of look alike. Whether we’re talking about Isaque or Isaac, there are a few issues that need to be addressed. I have no idea what revolve integral counting means. It sounds like it might be related to calculus (which Newton was instrumental in developing) but I’ve never heard that actual phrase before. Newton had nothing to do with the laws of thermodynamics. The memer is probably thinking of Newton’s Laws of Motion. I’m not sure how one opens a law. Perhaps with a law opener? Newton did not formulate the principle of conservation of energy. Although scientists in Newton’s time were aware of kinetic energy and were vaguely suspicious that something might be conserved, they did not know how to pull it all together. Scientists working in the mid-19th century created the first modern version of conservation of energy…more than a century after Newton’s death. Newton did a lot of important things in his life, but you don’t help your argument by not knowing what they were. Now let’s talk about Richard Dawkins, the evil atheist and evolution proponent. It’s true that Dawkins did not study the nature of light, invent calculus (or revolve integral counting), open any major laws of physics, or become a father of modern astronomy. Then again, he didn’t have to do any of those things because they had all been done long before he was born. Are Dawkins’s opinions any less valid because he did not literally re-invent the wheel? This meme is entirely pointless. The author wants to discredit Dawkins and all atheists (and perhaps evolution accepters) by showing that Dawkins’s list of accolades is shorter than Newton’s list, but he fails to explain why that’s relevant. Dawkins’s arguments should be judged on their own merits, and not because he hasn’t turned the scientific world upside down. One more thing, memer: there are plenty of modern scientists who do believe in God and whose accomplishments are no more impressive than Richard Dawkins’s. Why don’t you single them out for an unfavorable comparison to Newton? Oh right, because it would reduce the strength of your argument to zero. And so we come to the end of Creationist Meme Week. We have plenty of racist, sexist, and generally unpleasant memes that need discussing, so we’ll give the Creationists a break for a while. Now I would never encourage anybody not to argue in favor of evolution, particularly when so many Creationists are actively trying to wedge their religious beliefs into public school curricula. But I wouldn’t send you to war with a pea-shooter. Please, before you try to do intellectual battle with a Creationist, arm yourself with knowledge. Study evolution and know its components. Learn the difference between facts, laws, and theories, and don’t ever say that theories become laws or facts when they are proven! Read the most common Creationist arguments and the responses written by people who truly understand the topic. Like I said, there’s a grain of truth in this meme, but it’s also wrong: just as there are many evolution accepters who do not understand evolution, there are many that do understand it. And they still argue for the reality of evolution, because they have seen the evidence, and they do not have a conflicting agenda which causes them to ignore it. They know that the evidence is massive and that it all points to the same conclusion. Evolution has happened, is happening, and will continue to happen as long as there is life. 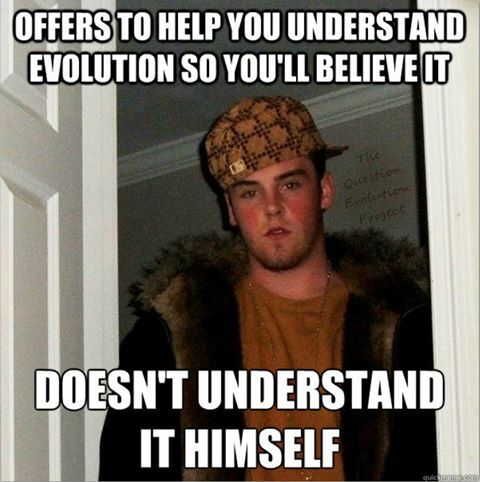 As for the poor fellow whose picture formed the background for this meme…I can’t say whether he supports or rejects the idea of biological evolution. I hope that if he does accept it, he has studied it enough to know why. 1. Honestly, the Creationist will probably think he has won anyway, regardless of the actual outcome. Just don’t make it easy for him.